Uglyworld #806 - A Goblins Favourite Tipple (275-365), originally uploaded by www.bazpics.com. There's no point in trying to deny it, Babo knows that all of you have spent at least one (if not many) sleepless nights lying in bed thinking to yourself, "What is a goblins favourite tipple?". Thanks in no small part to our resident friendly goblin, Gordon, I'm able to finally answer that mysterious question. 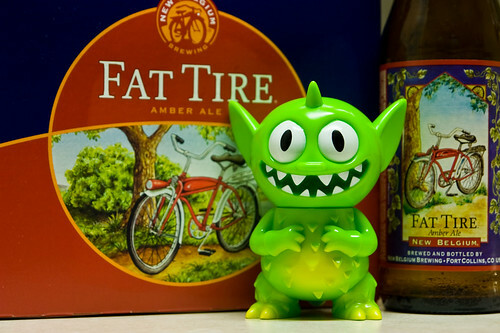 "Fat Tires is the bestest, is just perfects for the bellies of goblins, great tastes and we gets no hangovers froms it eithers!". There you go, looks like we've a proper old Saturday Scoop there...!! !